Discussion in 'Henson Alternative' started by TheMonsterAteMe, Feb 2, 2011. And they are singing something.. well.. odd for them. To be clear... this is NOT "The Muppets" this is Jim Henson Company puppets. That means no Kermit, Piggy, Gonzo, Lew Zealand... so don't freak. It's most likely Puppet Up puppets. I think a thread title change would be good so we don't confuse people too much. Still looking forward to this appearance though! 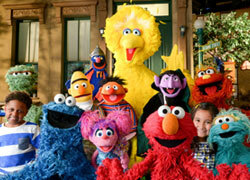 The Muppets to perform @ the GRAMMYS! To clarify once again... these are not The MUPPETS that Disney owns, these are just Jim Henson Company puppets--most likely from Stuffed and Unstrung and Puppet Up! So... Kermit, Piggy, Fozzie, Lew Zealand... not going to be performing with Cee Lo Green and Gwyneth Paltrow. Still a very exciting appearance though! A local radio station was talking about this yesterday and were saying "The Muppets" and I was like "what? I didn't hear the Muppets were performing!" So thanks Prawnie for the clarification! I am tempted to call said radio station, lol. Can anyone tell me what those futuristic-looking puppets were from? They looked very familiar. To be clear... this is NOT "The Muppets" this is Jim Henson Company puppets. That still makes them Muppets irregardless if they can be legally refered to by that term or not. But nonetheless, that was a pretty cool thing to watch, I'm not usually one to sit through award shows in their entirety, but seeing this was worth the watch, lol. I knew I saw Piddles the Pug in there amongst all the mayhem, lol. For "non-Muppets", that costume sure recalled Elton John's TMS opening number, didn't it? I see that the "Muppets" did not perform at the Grammy show tonight, but they are Jim Henson "puppets". This fact would be oblivious to a child. All they see is the what looks like a "Muppet". The look is unmistakeable to a child. "Muppet" or "Puppet", to have Jim Henson's characters associated with such a VULGAR song is unbelievable! I don't care how the music industry has dressed-up this song for airplay, it still contains a word in it's original lyrics that is horrible for a high school student to utter, not to mention a child to have to hear! And don't come back here and say that they replaced the word with "forget"! Children these days are smart! With one click, they can get on the internet and find out! Shame on you, Henson "puppets"! Shame, shame, shame! Parents have depended on your "puppets" to teach their children life lessons and now this! Shame on you! I gotta say! That is very similar to Elton's costume! Also, some of the band members, to me, just scream Solid Foam and Jim Henson Hour. They seem very futuristic and creative! Especially the drummer! Lastly, the three female dancers look very similar to some early TMS Season 1 whatnots! This is heck of a lot like the Muppets except for a few odd characters! I think the futuristic looking puppets were originally created for the "City Kids" series. It was great seeing Piddles too. I unfortunately didn't catch it on tv since I didn't realize it was going to be on but I just saw part of a very ghetto video clip of it on youtube and I really did think at first that Elton John had turned into a large black man and I was very confused. If anyone finds a better quality of the video please post the link. He was just saying they weren't THE Muppets, the classic muppets that everyone thinks of when they hear the word "muppets". Since we're arguing semantics, it should be made clear that the use of the word Muppet here is correct. Saying the Muppets were involved doesn't limit the reference to only Kermit, Fozzie, Piggy etc.. as defined by the Henson Workshop: "Individually, a Muppet is made by Jim Henson or his company's workshop." The performers at the Grammys were indeed Muppets by that definition, just as are the Skeksis, Ludo or the LaChoy Dragon from years ago. For that matter, it's got nothing to do with Disney either, at least to a certain extent. 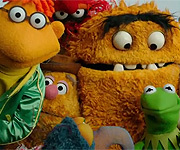 Muppets found on Sesame Street are separately owned and copyrighted by Sesame Workshop and The Jim Henson Company which are not part of the Disney family. I must say Elton John must be surprised by the flattery he received by that performance. Also, even if they aren't the actual Muppets, they're still Muppets regardless since they were created by the Jim Henson Company. That's it! Thank you, Ploobis! By the way, you've officially got my favorite name on the Muppet Central boards! Awesome choice! I agree. I don't care if it's 1975 or 2075, non creature shop puppets from the Jim Henson Company will always be "Muppets" to most of us. I mean shoot, they use quite a number of Muppet puppets for Stuffed and Unstrung and the former Puppet Up. I've always see a giant "Hensonverse" ala Toon Town in Roger Rabbit that includes countless worlds and properties. But "The Muppets"(tm) would of course be the Muppet Show characters and universe. I missed the first few minutes of the appearance (when they first came out), but from what I saw, it was alot of fun. And that HAD to be a tribute to the Elton John Muppet Show appearance. If it wasn't intentional, my goodness... lol Fun number though.